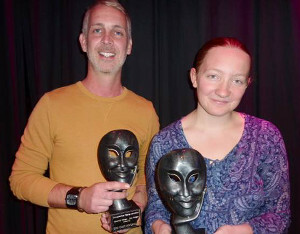 Wotton Dramatic Society celebrated a double triumph at the Gloucestershire Theatre Association's annual awards evening at the Kings Theatre, Gloucester on Saturday 28 September. "Babes in Toyland", last year's Christmas show, took the prize for Best Pantomime. GTA adjudicator Sheila Mander presented the trophy to Rosie-Mae Rivers-Cole, praising the Society for nurturing its younger players. All younger cast members had also been jointly nominated for the Best Young Performers award but lost out to Sam Forbes, an outstanding singer and actor from Cheltenham. It wasn't just the "Babes" who had something to celebrate. "Tristan Holland's performance as Widow Peep was full of skill, expertise and joy" said Sheila Mander. "He had complete control of the audience from the moment he came on stage. I never had any doubt that he would be the winner of this year's Best Comedy Performance." "Babes" director and co- author Jane Parker couldn't make the ceremony, but said later how delighted she was for Tristan and the whole cast and crew. "The skills our youngsters have acquired from the panto are developing nicely and will be put to good use in our next production. The next production from Wotton Dramatic Society is Old Time Music Hall, in Wotton Town Hall from 30 October to 1 November. Audience members will be invited to come along in period costume, relive the spirit of ‘the Good Old Days’ and join in with the songs. Seating will be Cabaret Style with snacks included in the ticket price and there will be a bar with drinks, alcoholic and non-alcoholic, available at reasonable prices. Tickets are now on sale at the Cotswold Book Room, Long Street.